First things first: we highlight immediately the return on the regular series of some historical artists of the serie, like Giovanni Freghieri, Bruno Brindisi, Corrado Roi and Franco Saudelli. In the spring, Gigi Simeoni is the writer of a couple of albums with a common theme. Paola Barbato will prove herself on an episode centered around the triangle formed by Rania, Carpenter, and Dylan. Giovanni Eccher will be the author of a tale fraught with phobias and horrors. Pasquale Ruju will also come back, with a plot rooted in the "maudit" literature. Summer will see an historical issue, thanks to the most important Italian personality of contemporary horror: Dario Argento! Summer will be the time for an historical issue, by the most important Italian personality of contemporary horror: Dario Argento. In collaboration with Stefano Piani, Argento conceived a particularly morbid tale, with themes from his cinematic masterpieces, for our "Lord of the Shadows", the artist Corrado Roi. A couple of stories by Simeoni and Barbara Baraldi (the first is connected with "Il sapore dell'acqua", and the comeback of an old enemy; in the second, we'll follow Dylan in one of his rare journeys abroad), will accompany us into autumn, with the awaited cycle of the Meteorite. This group of episodes, linked by an apocalyptic event, will take us to n. 400. The initial story will be written by Roberto Recchioni and Gabriella Contu and will see the return of John Ghost. A panel by Bruno Brindisi. Click to see the whole page. Three other Dylanian ace artists will take care of Old Boy n. 32, coming at your newsstands in February: Giampiero Casertano, Luca Dell'Uomo and Piero Dall'Agnol. 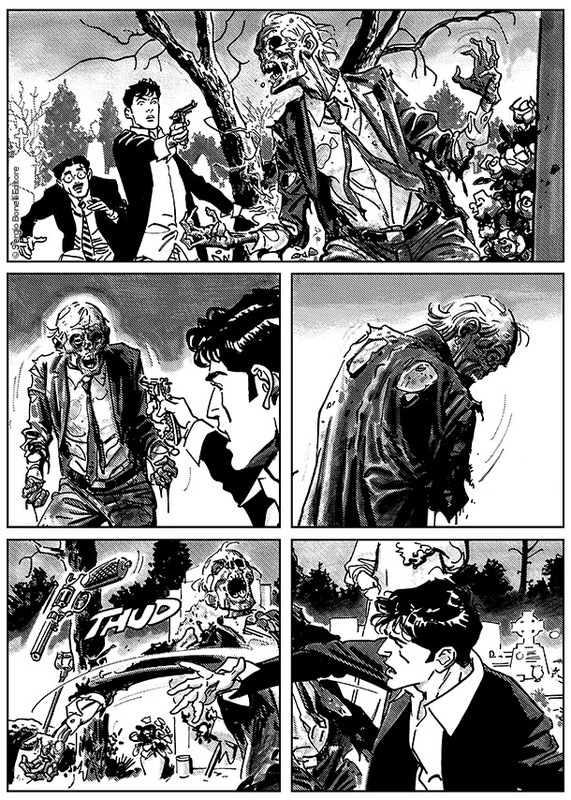 In summer, as usual, we'll have our customary "whale", a Maxi Dylan Dog entirely by the popular duo, Montanari & Grassani. Halloween will be the time for the finale of the "Oltretomba Western" saga, written by Giovanni Di Gregorio, with art by Luigi Piccatto. In the summer, a new, unexpected team-up will be in the spotlight: we won't tell you anything about it, but we are sure that it will surprise you. The Pink Rabbits saga by Luigi Mignacco will make its return in the next Dylan Dog ColorFest with the final chapter, where we'll find out whether toon characters can die or not. In summer, a new, unexpected team-up will be in the spotlight: we won't tell you anything about it, but we are sure that it will surprise you! The same goes for autumn, when in a special, one-off album we will publish a team-up pairing Dylan with another mysterious Bonellian character. Stay tuned! In the next Magazine, on the stands since March 23, a contagion plagues Wickedford, the town where Bloch and Jenkins are living after they retired. The disease will have unpredictable consequences for the local residents. And a new, young hero will take center stage in the new episode of the tragic saga of the Planet of the Dead, written by Alessandro Bilotta, with art by Giampiero Casertano.